Picture yourself fly fishing from a drift boat, or jet sled down a broad magnificent river, surrounded by tall pine and hardwood forests. Long wide riffles, deep pools and long eddies the size of several football fields hold brown and rainbow trout surface feeding to prolific hatches of mayflies, caddis and midges all day long - some fish approaching trophy proportions. 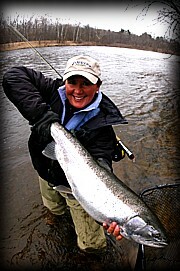 Wild origin stocked Michigan strain Steelhead and Chinook King salmon up to 20lbs haunt the gravel runs. And pacific king salmon in the 40 lb. Class haunt the river's gravel runs. The adventurous fly fisher will find challenging and at times fabulous angling from this world-class river. No, you are not on the encompassing Delaware River system full of wild trout in the Catskills of the East - not on Montana's Big Horn nor on British Columbia's or Alaska's rivers. 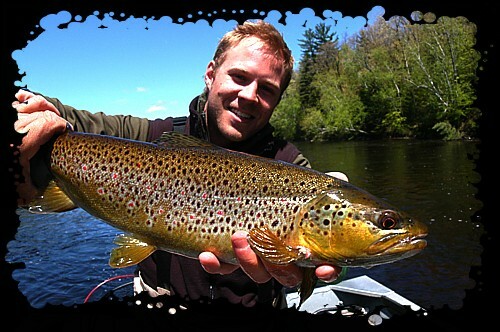 You're experiencing a day on Michigan's Mighty Muskegon River - a trout, steelhead and salmon wonderland! 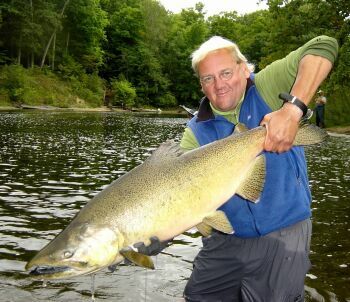 The Muskegon tail water is quickly becoming one of the finest Salmonid fisheries in the nation. With the new Federal Energy Regulatory Commission's relicensing agreement signed with Consumer's Power and new trophy trout regulations in 2000, the river will continue to become more productive each year with stable river flows and cooler, oxygenated water with a bottom draw bubbler siphon ready to begin in 2009,water quality will be significantly enhanced to promote more growth and natural reproduction of the rivers trout, steelhead and salmon populations which will hopefully lead to better quality fisheries regulations. An article in the July 1995 issue of Fly Fisherman, describes the variety and complexity of the river's hatches and the challenging fly fishing opportunities to be had. Each day, we are finding new species of mayflies emerging with trout showing a new set of selectivity references. With the constant flow and gin clear waters with vegetation, the Muskegon is like a giant spring creek. and the river also has exc ellent smallmouth bass and trophy walleye pike fishing in the spring and summer. When you come and visit us at the Gray Drake, you'll have up-to-the-minute information on insect activity and timing of the steelhead and salmon runs. You'll experience a deep forest setting filled with wild turkey, deer, ruffed grouse, American bald eagles and rich native flora of wildflowers and mushrooms. The absolute stillness of a clear starry night and relaxing days on the river will quickly make you forget about life's pressures and stress in no time.